Santa Catalina arch in Antigua, Guatemala. 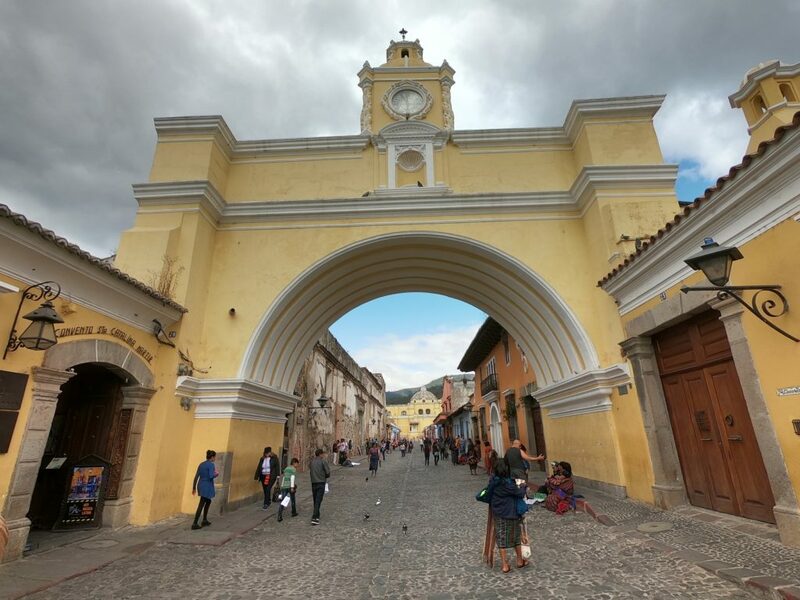 Santa Catalina arch is definitely the most visited sight in Antigua. It is located on 5th avenue and it is definitely reachable by foot from any part of the town. This arch was built back in 17th century and in 1830s the clock on top of the arch was added. It is definitely a great spot for instagram picture. On a clear day you can make a picture of both – the arch and volcano de Agua. This is the main square in Antigua. It is the place where locals and tourists hangout. There are a lot of different vendors selling their handmade souvenirs, fruits sellers and juice makers. This is a green place with a fountain in the middle. It is a good place to relax and enjoy the atmosphere. Viewpoint Cerro de La Cruz in Antigua. 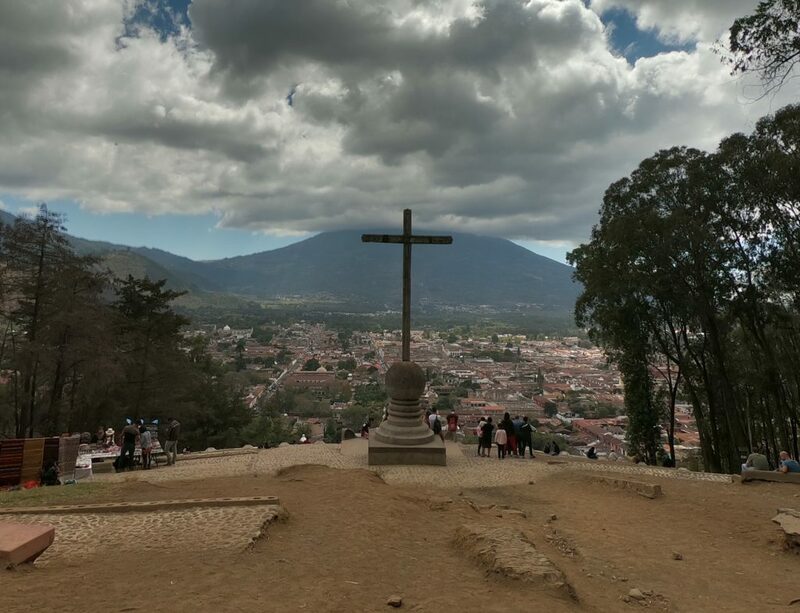 Cerro de La Cruz (The Hill of Cross) is definitely the best viewpoint over Antigua city and volcano de Agua. It is possible to take a taxi up to the viewpoint. More challenging way is to hike up the hill. Walking up the hill will take you around 10 minutes from the place where the path begins. Most of the path is made from concrete stairs, it is very easy to walk up them! Enjoy the view. 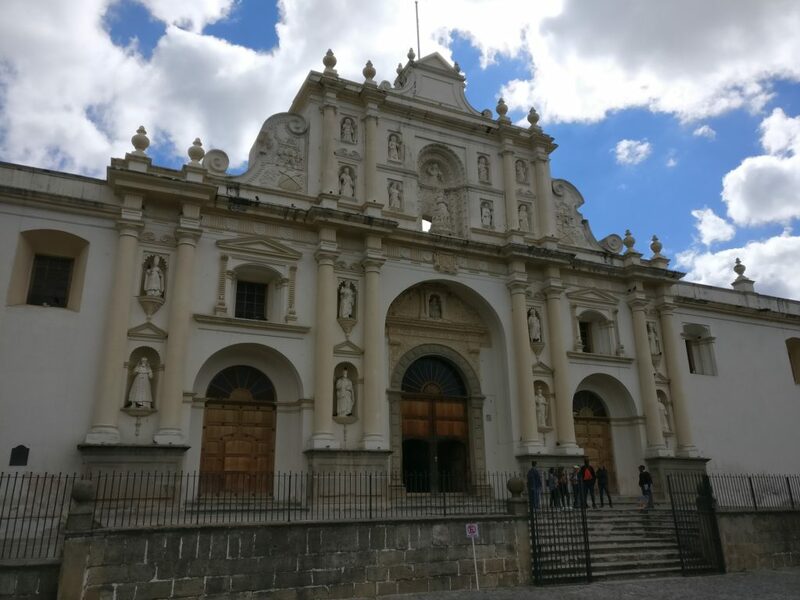 Located on the side of Central Park Antigua cathedral is a great example of baroque architecture. It is a Roman Catholic church which was rebuilt in 1680s. Nothing really spectacular, but worth a visit once you are near central park in Antigua. You might be lucky and see a church service. One of the souvenir shops in Antigua. 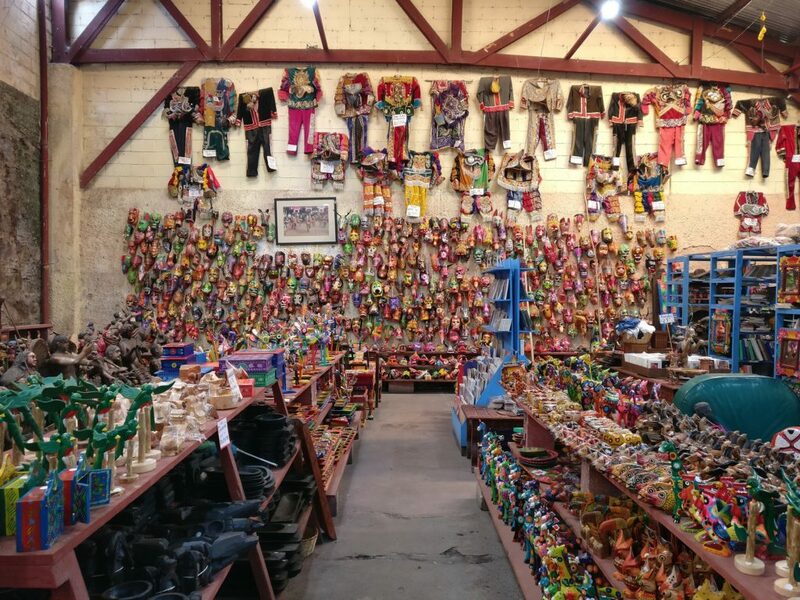 Antigua is a great place to find unique souvenirs for family or friends back home. Prices are cheap ant it is possible to negotiate. Different masks, belts, rings, scarfs, carpets, clothing are available. They are very colorful and unique, I can bet that you will not find something like that back in Europe or USA. Antiguo Colegio de la Compañía de Jesús. There are many beautiful ruins and old buildings in Antigua. Most of them had to survive the earthquakes. I cannot recommend anything specific. Just walk around the town and you will notice some beautiful old buildings. 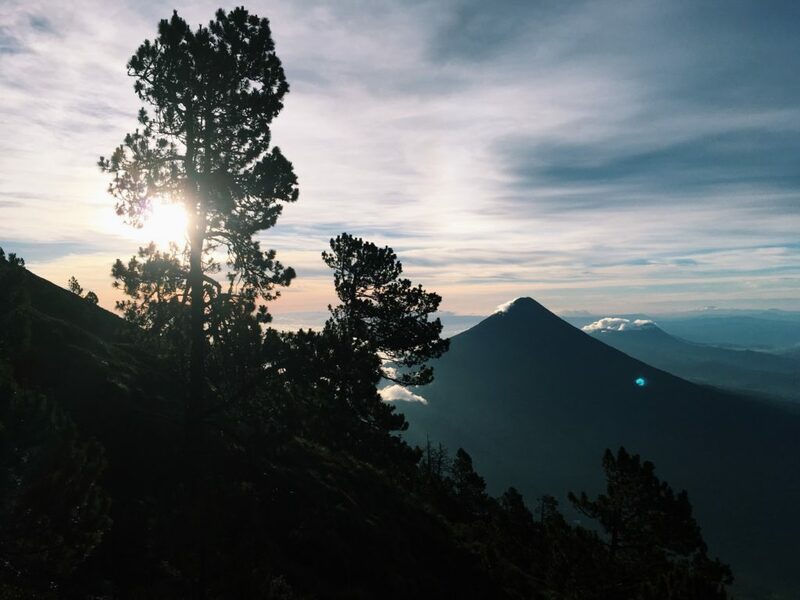 While in Antigua you should consider hiking Acatenango volcano. It could be done with one of the tour agencies in town or through your hostel. 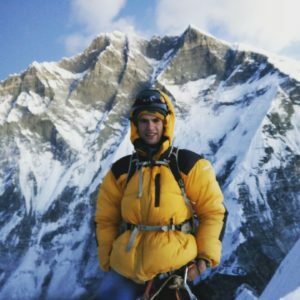 You will need to camp on the volcano and you will definitely enjoy sunset and sunrise. Don’t miss an opportunity to see one of the active volcanoes! 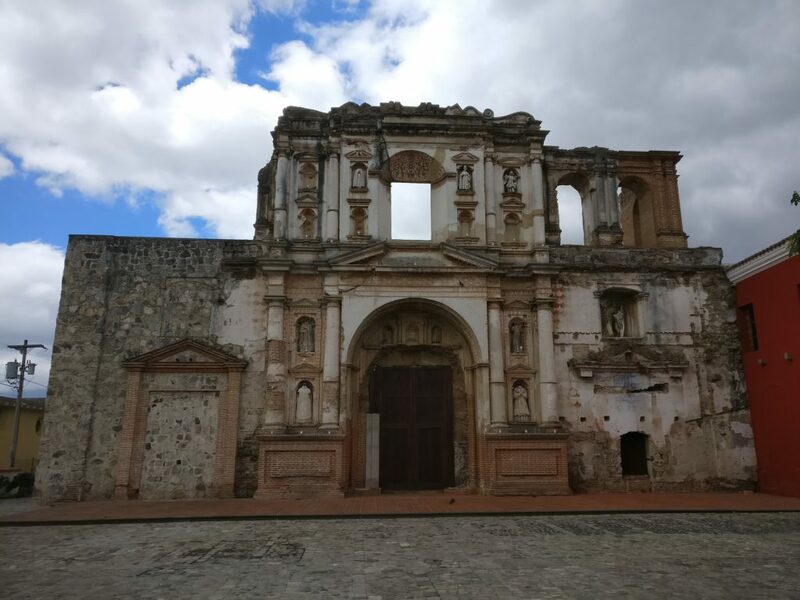 Which place is your favorite in Antigua Guatemala? Check out How to Reach Lake Atitlan from Antigua.